Slinfold Concert Band owes its existence to John Reed. John was born in 1932 and grew up in Slinfold. John Reed was an accomplished musician, playing both keyboard and brass instruments. He played the organ at St Peter's church in Slinfold and he played brass in other bands in the local area. John wanted to maintain the Sussex tradition of each village having its own band, and that is the start of the story. In his professional life, John was a language teacher at a secondary school in Surrey. In his spare time, John was the driving force of the Band taking on the roles of musical director, conductor and arranger as well as playing brass bass. As the Band continued to grow, and the workload of running the Band increased, John continued as Band President but was able to pass on some of these duties to John Groves and then later to Malcolm Gay. John continued to play bass in the Band right up until 2008, when the weight of the instrument became too much for him to continue. John Reed passed away at the end of 2012. 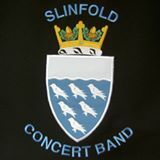 The Band played at the Service of Thanksgiving for John's life, held at St Peter's church in Slinfold in January 2013. According to the sleeve notes of Band's Silver Album, "Never dreaming that the small village band would grow to its present size, John is modestly proud of the Band's achievements".